I remember really enjoying the Giver, first when I read it in grade 7 and a few years later when I read the whole series, so this was a nice refresher and reminder of what I enjoyed about the book! I am back with another book review, The Giver Graphic Novel adapted and illustrated by P. Craig Russell. Thanks so much to Raincoast Books for sending me an ARC of this book for an honest review, as always, all opinions are my own. This book follows Jonas, an Eleven who is anxiously awaiting his career placement and transition into being a Twelve. I'm not going to go into a ton of detail on the synopsis because this is a sort-of retelling and I'm assuming that if you are interested in the graphic novel version of this book you probably know the storyline. First off, it was really great to experience this story again. My perspectives have changed since the other times I had read the story and the graphic novel gave me some of the visualizations that I didn't get when reading it before. That being said, I don't feel like there was a lot that changed from the original text to this one. Now don't get me wrong, I'm glad it was faithful and the author didn't completely change the story, but I just felt like I was reading the original book with pictures. For me - and this might just be me - you should adapt the text in a way that remains true to the story, but isn't ~essentially~ the exact same. 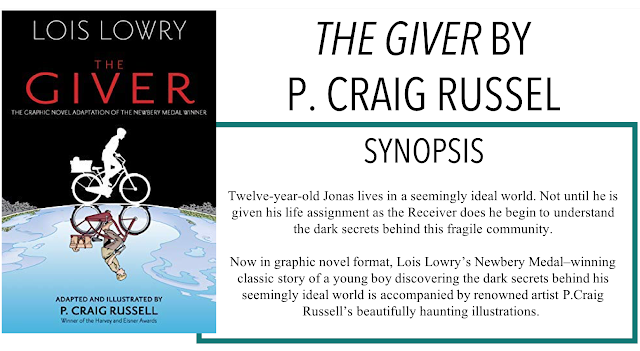 I was under the impression that this would be a take on the Giver, in graphic novel form - not the Giver in graphic novel form. I absolutely don't hate any part of the illustrations or storyline, I just feel like they could have pushed the envelope a little bit with where they wanted the story to go. I will say, though, that for readers that are new to the story or those who are required to read it for school, this would be a great addition to class discussion and for use by those who learn better visually. I think it's a close enough adaptation that nothing vital is left out and it would perhaps get those more reluctant readers engaged in the story. Overall, a faithful adaptation that, while could have pushed a little further, will likely resonate with a new generation of readers.